The Breville sandwich toaster is the original toastie maker, and still the best. A much-loved brand and kitchen appliance in British kitchens for decades, the latest range includes handy modern innovations to make perfect toastie preparation even easier. The Breville sandwich toaster was the world’s first and launched over 40 years ago. 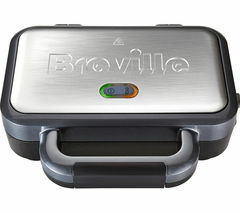 To this day, Breville continues to innovate, and its comprehensive range of simple-to-use and affordable toastie makers now includes panini presses that accomodate focaccia and ciabatta. Delivering delicious and creative hot sandwiches, they spice up lunch times and snacks for the whole family. Choose from machines that will turn out the classic toasted sandwiches you loved as a kid to modern sandwich presses that allow you to replicate the tasty paninis of your local coffee shop. The two-slice Breville toastie maker range is really easy to use, with power-on and ready-to-cook indicators clearly displayed on the top. Its patented cut-and-seal technology ensures you enjoy a crispy exterior and gooey inside every time you toast. It delivers perfect toasties without leakage, slicing each sandwich in half and sealing it to contain all the filling. Cleaning up is easy, as the machine’s non-stick plates can be removed effortlessly and safely washed in the dishwasher. If you like extra filling, the Breville Deep Fill toastie maker is the brand’s deepest fill ever, allowing you to pack more into your snacks. 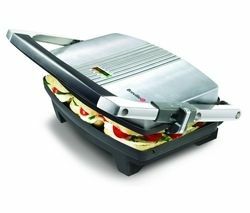 Or for panini perfection at home, a cafe-style sandwich press makes light work of up to three panini sandwiches at once. With large, ergonomic handles and a hinged lid, you can press a whole range of other breads and sandwiches, including filled naan breads, ciabattas, crumpets, croissants, teacakes and more. Expertly designed with a host of handy features, today’s smart toastie makers look the part in any kitchen. For a wider selection of versatile toasting options, view all of our sandwich toasters, including the latest Russell Hobbs sandwich toasters.